LOS ANGELES, CA, June 3, 2013 – Summer is the time for fun, and Dogeared’s Summer 2013 line injects a whole lot of fun into the mid-year mix—yet one more reason to love this time of year! All new designs, new message cards and new ideas build upon what Dogeared does best: handcrafting quality jewels that make people happy. Personalization is one trend that’s showing no signs of slowing down, and Dogeared’s expanded assortment of initials and charms gives customers more ways than ever to make a style statement that’s uniquely their own. Core collections have been infused with a fresh, modern energy. Lots of rose gold and charcoal has been added into the standard metals mix of silver and gold. Iconic, on-trend designs – like Dogeared’s signature wishbones and infinity symbols – are hotter than ever, and now there are even more ways to wear them. These are the go-to pieces and style staples that everyone – from celebs on the red carpet to everyday customers – want to live in. From A to Z: Spell it out with Dogeared’s new line of initial rings, single earrings, necklaces, and bracelets. Mix and match to create words, initials…send any message you choose! Travel Charms: Navigate your way through life safely with our new travel charm necklaces and bracelets featuring St. Christopher medallions and charms. 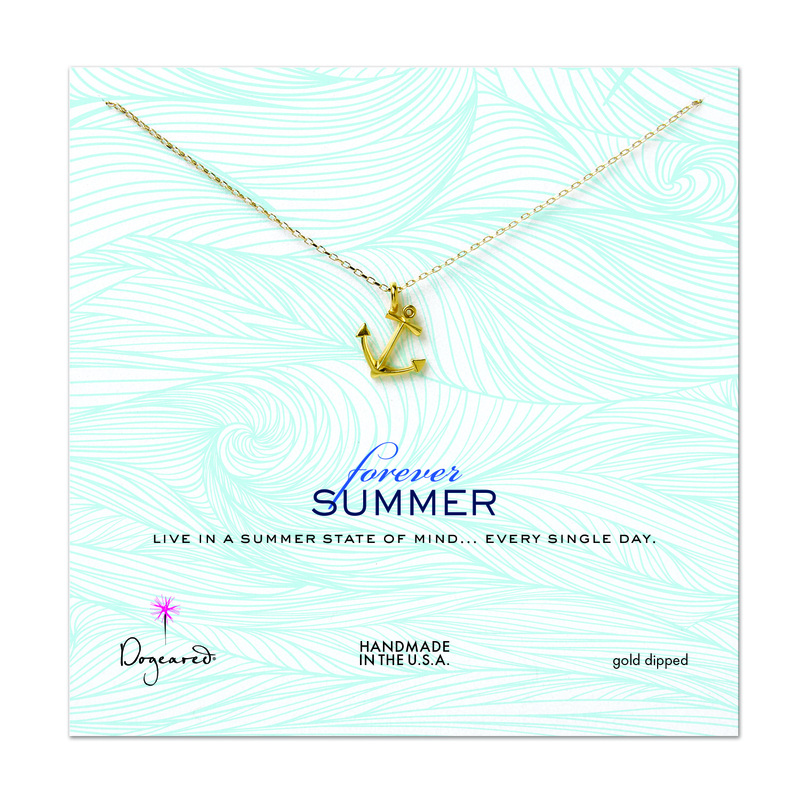 Forever Summer: Live in a summer state of mind all year round with these captivating new sterling silver and gold-dipped summer-themed charms. 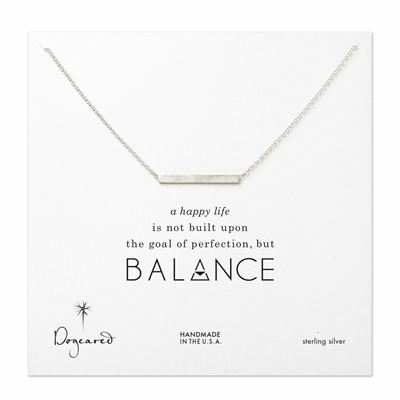 Balance Line: Ensure balance in your life with this new selection of simple statement hammered and solid bar necklaces, bracelets and earrings. 100 Good Wishes: Bring good fortune to those you love with an expanded assortment of 100 Good Wishes sparkling bead necklaces, symbolizing endless good wishes (available in 32” & 34” lengths). Wish: It all starts with a wish. Make all your wishes come true with Dogeared’s new “Wish” collection offering small, medium and large wishbone necklaces, bracelets, and rings. Infinity: Our forever favorite is now available in even more styles and with updated cards as a reminder that the possibilities in life are infinite. 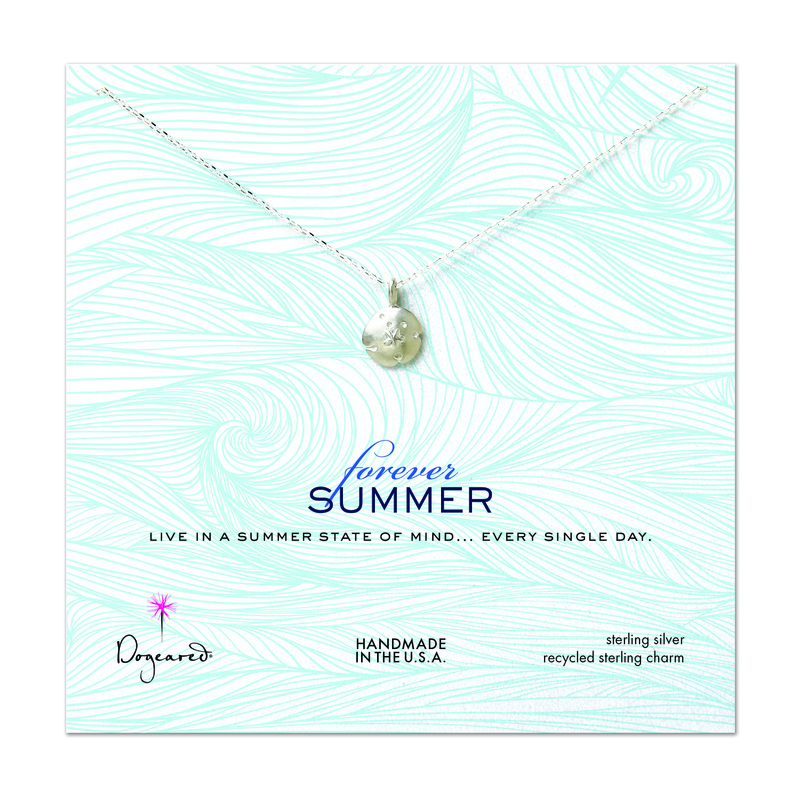 Karma: Keep the circle positive with new sparkling Karma necklaces, brand new hoop earrings in a wide variety of sizes and colors and stacked sparkle rings. Dogeared Bracelets: Pile on the charm with our new soldered charm and chain bracelets—perfect for layering. Make A Wish/Reminder Necklaces: Make a wish and then hold it close to your heart with our favorite, every occasion necklaces—now boasting even more charms! Simple Truth: A little love goes a long way with petite sterling silver and gold-dipped charms on 16” chains w/ 2” extenders. And then step out in style with Dogeared’s new exclusive dogeared.com anklet collection, featuring seven styles in gold dipped and sterling silver with all the charms you love. It’s the perfect summer look! Against the backdrop of the sun, sand and surf of Southern California, Dogeared was born. The originator of “word” jewelry, Dogeared’s founder Marcia Maizel-Clarke believed that jewelry could be both beautiful and meaningful. A core component of Dogeared’s mission has always been to put positive, peaceful and loving energy into the world…by handcrafting everything locally, employing sustainable business practices wherever possible and partnering with non-profit organizations who share a vision of a better world. In 2011, Dogeared became a certified B-Corporation – joining a community dedicated to creating a better way to do business and “B the change.” Dogeared’s unique, custom jewels regularly appear on the hottest celebs, in fashion and lifestyle publications, in films, on TV shows and on the red carpet. We are proud partners with trendsetting Industry leaders such as Nordstrom, Neiman Marcus, Bloomingdale’s, ASOS, Zappos.com, Amazon and ABC Home, among others. 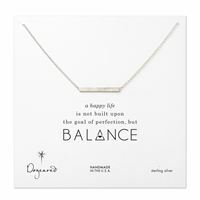 You can find our retail store at dogeared.com. For wholesale information, please visit www.dogearedwholesale.com. Designer Marcia Maizel-Clarke founded Dogeared Jewels & Gifts over 21 years ago in Southern California. Originating word jewelry, she began creating beautiful pieces with the purpose of putting positive, peaceful, and loving energy into the world. This energy has always included being kind to the planet, handcrafting all the jewels and gifts in California, and working with non-profit organizations sharing a vision of a better world. Dogeared's unique, custom-cast jewels are regularly featured in fashion, lifestyle, and celebrity publications, in films and on television shows. Trendsetting retailers around the world, including Nordstrom, Neiman Marcus, Bloomingdale’s, Fred Segal, and ABC Home, all carry Dogeared. Dogeared is a certified B Corporation. Please visit www.dogeared.com for Dogeared's online flagship store. For wholesale information, visit www.dogearedwholesale.com.